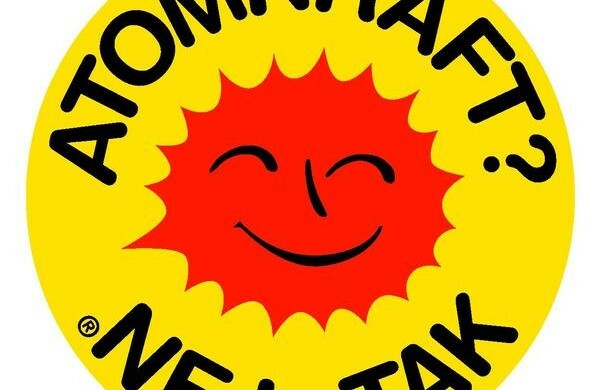 Designed in April 1975 by Anne Lund in collaboration with fellow Danish activist Søren Lisberg, the ‘Smiling Sun’ logo soon became internationally synonymous with the anti-nuclear power movement. Emblazoned with the boldly lettered slogan “Atomkraft? – Nej tak!” (Nuclear power? – No thanks! ), the cheerful, vividly-coloured logo came to be translated into 45 languages and becomes a central fixture of grassroots movements the world over. In tracing the events leading up the logo’s creation, it’s worth noting that in the middle of the last century, nuclear power was regarded quite favourably. The first step towards a nuclear Denmark was taken in 1958 with the construction of a reactor in Risø. Renewable low carbon energy promised to alleviate dependance on fossil fuels and provide the country with electricity that would come at a cost so low it was barely measurable, thus popularising the phrase “Too cheap to meter”. The early 1970s, however, were a period in which that initial wide-eyed enthusiasm of the ‘50s eventually began to subside, paving the way for a more sceptical ‘80s. This reversal in public perception was hard earned. Organisationen til Oplysning om Atomkraft (OOA, the Organisation for Information on Nuclear Power) was founded in 1974 by a concerned young citizen, Siegfried Christensen. The OOA members, all in their early 20s, had a clear mission: to rid the Danish landscape of nuclear power once and for all. They appropriated the Smiling Sun as their public face, intending to communicate a distinctly non-violent approach. The Smiling Sun made its public debut on 1 May 1975 in Aarhus, and one year later in May 1976, the then minister of commerce proposed an energy policy to introduce nuclear power as a substantial energy source for Denmark, with plans for five new plants to be built by 1995. The fight had begun. Nearly 40 years later, following on from the disaster at Japan’s Fukushima plant, issues of economy versus stability are once again placing nuclear energy at the centre of international debate. That debate is one which is as difficult today as it has ever been. In 1974 Denmark was in the midst of an oil crisis. Then, as now, nuclear energy was championed by some as the best solution to the problem and politicians were left to weigh things up. So how does one possibly go about weighing up the importance of such disparate factors as security, health, economy and engineering against one another? In Denmark in the 1970s, there was (and still is) a huge dearth of information. So much was unknown, particularly in relation to the long-term damage caused by radiation (in varying doses) to building materials, crops, cattle, people, land etc. Indifference and lack of public knowledge was a powerful ally to those in favour of the new policy. Recognising this, and identifying the need for wider learning, the OOA set about educating the Danish people. Their primary methods came via the distribution of leaflets and the organisation of gatherings, marches, lectures and exhibitions. Their commitment to peaceful protest and promotion of clean, alternative energies (such as wind and hydro turbines) elevated awareness of the OOA and gave rise to a sister organisation, OVE (the Organisation for Renewable Energy). Meanwhile, directly opposing this was REO (Real Energy Information), an organisation formed in 1976 that employed similar educational methods but sought to garner support in favour of plant construction. The OOA and the Smiling Sun were both given a considerable boost in the public consciousness when in 1977 they led marches in opposition to the completion of a Swedish plant in Barsebäck, which lies just 25km east of Copenhagen. Support continued to grow in 1979 following the disaster at a plant on Three Mile Island in the US. Danes, along with the world, watched their TV sets in horror as a reactor at the plant underwent a core meltdown. The following winter of that year, OOA volunteers delivered a leaflet entitled ‘Denmark without nuclear power’ to every single home in the country. After more than a decade of campaigning, the OOA won a major victory in 1985 when the decision was taken by Danish parliament to stop constructing nuclear reactors. It was an important moment for the OOA, but also a bittersweet one, as following this sense of accomplishment, support for the OOA naturally began to lose momentum. The following year saw a catastrophic explosion at the Chernobyl plant in Ukraine which, partly due to Soviet secrecy and misinformation, led to mass contamination. This tragic event occurred 28 years ago (26 April 1986) and the effects are still being felt today. Its legacy is clearly visible in the land and the people. Worldwide concern about nuclear power was raised to a new level. It prompted the OOA to examine the causes and consequences of Chernobyl, and their findings bolstered their attempts to close reactors in Barsebäck, while highlighting a worrying trend of unstable reactors throughout eastern Europe. In light of both their dwindling numbers and another success: the impending closure of Barsebäck’s final reactor, the OOA disbanded on 31 May 2000. Despite this, the far-reaching influence of their Smiling Sun continues. In 2007, a Slovenian version of the Smiling Sun was added to the list of translated languages. Anne Lund and her early OOA collaborators could not have predicted the enduring potency of this symbol for peaceful defiance and clean energy.